Blue Morphius butterfly, shot at the Seattle Science Center. Didn't get scared from Sony DSC-F717 ,nice shot, i like it!!! Twos and threes, I just don't get it. What is wrong with this? Fess up, I won't hurt you! why why why why why why? Excellent detail. Good contrast between the browns and the pink. Is this the best you can do with your fancy new camera? I guess it's good enough. Beautiful picture...nice job good detail and nice focus. AWESOME! Text book perfect - as far as I'm concerned. Can't get above 10. PTL This is so refreshing. A shore 1st place - or should be. 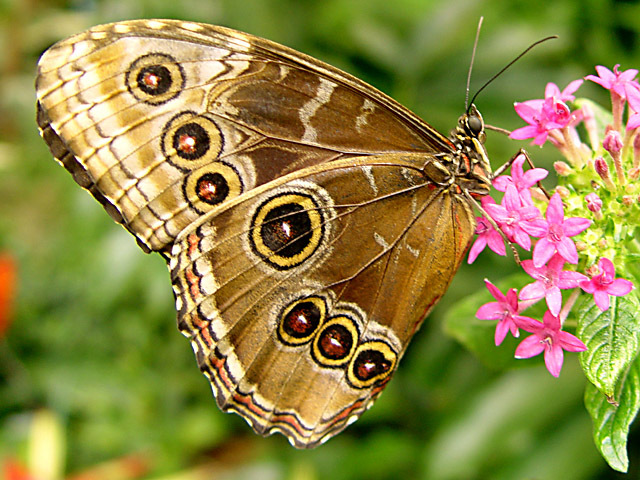 Beautiful picture and beautiful butterfly/moth. It seems a little too bright, however. Probably shorter exposure would have helped a little. Nice shot in focus, nice composition. I have one that looks just like that... wonderful image. Bold and striking. Good balance in the composition. Nice colors - very good photo. The brightness may be up just a tad too much. "pretty" vivid. i like it. Nice composition and color, seems a bit fuzzy though. I knew there would be flower pictures, and I knew there would be insect pictures (does this class as an insect?). Nevertheless this is an excellent photo. Great detail on the wings, would love to see the full size version next week. DOF is good, colors are a little washed out. Stunning, this is what macro photography is all about. Proudly hosted by Sargasso Networks. Current Server Time: 04/25/2019 07:43:12 PM EDT.